The names and locations of the many Naval establishments on and around Portsea Island are familiar to many of the residents of Portsmouth in the 21C, but there is one that is perhaps less well remembered. Horsea Island lingers at the edge of local awareness and even if the mention of it causes memory to flicker a little it would probably be assumed that, in common with many other such places, it had long since ceased to exist. To some extent they would be both right and wrong. 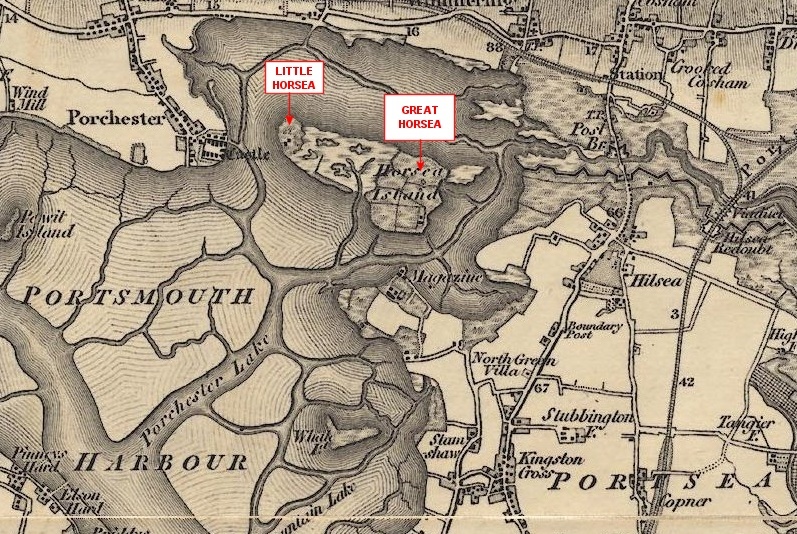 Horsea Island was, until 1885, two islands, Great Horsea and Little Horsea, situated at the northern end of Portsmouth Harbour. Both are known to have been places of agriculture, possibly since Roman times, despite their low lying nature and tendency to flood during high tides. At low tides the two islands were of 166 and 56 acres in size, the larger being part of Wymering and the lesser part of Porchester. 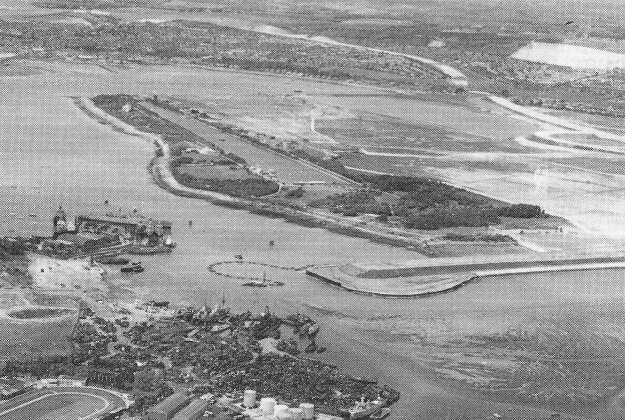 They had originally been connected to the mainland by three 'wade ways', one to Tipner Point, another to Hilsea and one to Stamshaw but the first fell out of use as Tipner developed as a Naval Magazine, the second was lost to major episodes of flooding whilst the Stamshaw route remained until the 1970's. In December 1884 everything was set to change when the Admiralty asked the then owner, Mr. Bovill-Smith, if they could purchase both islands, their reason for doing so relating entirely to the development of new forms of warfare, in this instance, the torpedo. Invented by Robert Whitehead in 1866, the torpedo had been taken up by the Admiralty by the mid 1870s who set up a department charged with the development of torpedo warfare within the Gunnery School at HMS Excellent, then occupying a group of hulked ships moored north of the Dockyard in Fountain Lake. The torpedo work was actually sited on HMS Vernon. It was plain from the outset that the Fleet Torpedo Department as it was called would need a substantial stretch of water in which it could carry out experiments. Trials were initially carried out at Stokes Bay, off Whale Island and in Portchester Lake but none of them were entirely suitable. As the department specified a range of 800 yards in a non-tidal area from which the public could be excluded there were not many options available locally and so it was proposed that the two Horsea Islands be joined to form an area in which a suitable range could be constructed. To achieve this, formidable obstacles had to be overcome, not the least of which was the transport of the thousands of tons of earth needed to bridge the space between the islands. It was eventually decided that the chalk available under Portsdown Hill would be used. Moving this material required some ingenuity in which a railway track was constructed between the hill and the foreshore at Paulsgrove where the chalk was loaded onto barges which were pulled across to the islands by a steam engine brought across the Hilsea wadeway for the purpose. Much of the building work itself was carried out by convicts from Kingston Prison who lived on the island for up to two and half years, the time it took to complete the project. Horsea Torpedo Range was officially opened in March 1889. The range itself was 800yds long, 20yds wide at the firing end and 80yds at the other with a depth varying from 20 to 30 feet. The firing structure was two stories high with two firing tubes at 5 and 11 feet above the water and another submerged tube. In 1889 the base was manned by 9 seaman and one Petty Officer but within a year this had been increased to 6 Petty Officers, 14 Seamen and 5 5tokers, the whole coming under a Commissioned Gunner (T) who reported to the Captain of HMS Vernon and travelled to the island daily. By 1898 a permanent residence for the officer-in-charge had been built on the island but the centre of the Navy's torpedo warfare section remained at HMS Vernon which transferred to Gunwharf in 1923. Torpedo technology developed rapidly and by the late 1890s it was apparent that the range was too short but it took until 1905 before work to extend it to 1,115yds was complete. Details of the research carried out at Horsea is not available but it is reported that in 1892 some 301 torpedos were taken to the range whilst in 1898 the number had risen to 650. Further research work on torpedos continued at Horsea until 1939, but long before that, the island had also become the centre of an entirely different activity. In 1899 the Navy adopted the Marconi system of Wireless Telegraphy (W/T) and set up a school to develop it's use which it based at HMS Vernon. The early systems were rather low powered the equipment for which was set up on HMS Warrior (renamed Vernon III). In 1902 the station was upgraded to medium power enabling clear signals to be transmitted up to 300 miles at sea. This was extended to 1000 miles by 1906 by which time high powered transmitters were becoming available and the Navy decided to set up three new stations at Gibraltar, Cleethorpes and Horsea Island. The new station at Horsea consisted of 4 wooden aerial masts of overall height 150 feet with 8 'spreader' masts of 60 feet surrounding them. Power was delivered to the site via an underwater cable from the dockyard. For the first time security at Horsea became a serious issue and fences were erected around the masts and an extended guardroom manned 24 hours a day. Developments in W/T were being made with such speed that this first station was out of date within 6 years and plans were made for a truly impressive array of 4 masts of an overall height of 446 feet, which when erected were said to have been the tallest in Europe. The first went up in 1913 to be followed by two more in 1914, the last though not finally being erected until 1921. The masts, which dominated the Portsmouth skyline, were constructed as a triangular wooden lattice about 7 feet each side. They had no taper and were instead supported by galvanised steel cables attached to mighty anchor sheaves. The first three had hardly begun their work before one of them was involved in a bizarre accident when Flight Commander E.A. de L. Ville flew his Sopwith Baby seaplane from Calshot into a mist over Portsmouth and struck one of the masts at a height of 360 feet. Hearing the crash Able Seaman Rath, Able Seaman Knoulton and Deckhand G. Abbott began climbing up the outside of the mast until they reached the plane where the found the pilot hanging over the front of a wing, unconcious. Somehow they managed to manoevre the pilot into a bosun's chair and lower him to the ground where he made a full recovery. The three men who climbed the mast were awarded medals for extreme bravery; the mast, despite repair retained a permanent kink at it's highest level. By the end of the Great War the improvements in torpedo technology had almost rendered the Horsea range redundant as it's 1,100 yds was no longer sufficient for full scale testing. This work was largely transferred to the Stokes Bay Torpedo Experimental Station but Horsea was not neglected, instead it received a full modernisation of it's equipment such that it could play a major role in the development of motor torpedo boats and submarines. The W/T station also received an upgrade which enabled it to take part in various experimental technologies such as remote control of a ship by wireless. By 1933 wireless technology no longer depended on the wooden masts and they were replaced by steel towers of 180 and 100 feet in height. The demolition of the wooden masts was considered to be such a momentous occasion that it was witnessed at close range by the Commander in Chief, Portsmouth, Sir A.K. Waistell. The steel towers themselves became redundant after the second world war though the W/T station remained operational until about 1960. Horsea's role in later years became diversified, from providing facilities for swimming lessons, the training of divers and fire fighters and amphibious tank trials. 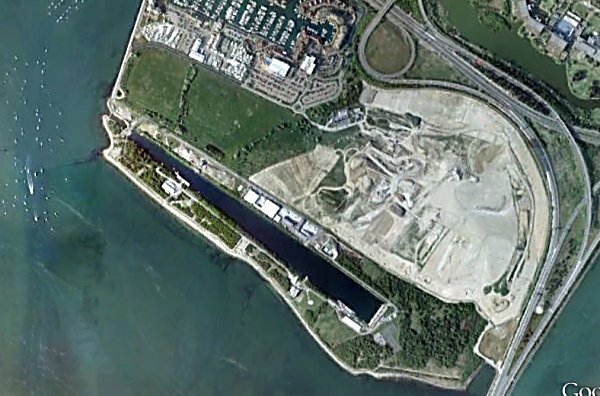 In the early 1970s Horsea suffered a major identity crisis as it's status as an island disappeared when much of the adjacent harbour was reclaimed to form Port Solent and a mountainous land-fill site. The original range can now be accessed by road though it remains a serving Naval base attached to HMS Excellent.